Start by choosing where you’d like to wall-mount your Micro. You’ll need an ethernet cable equipped with POE running through your wall—Any Cat5, Cat5e, or Cat6 cable should work. Contact us if you have questions. A great place to mount Josh Micro is on the wall near the entrance to room at conversation height, approximately 5 - 5.5ft. You will find that Micros fit well in similar locations as thermostats and light switches. Learn more about Micro placement here. 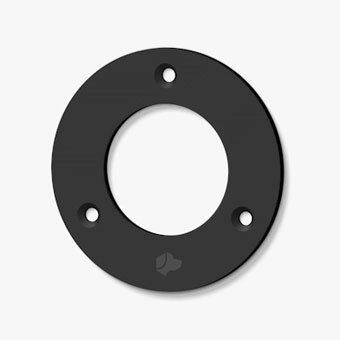 Hold the black wall mount ring (included) up to the wall you’ve chosen to mount Micro to. Mark the inner circle and the three screw locations in pencil. Don’t worry if the base screw holes aren’t lined up perfectly. Josh Micro magnetically attaches to the base and can be straightened at any point. Drill holes for the wall screws and a center hole for the POE cable. Again, don’t worry if the base screw holes aren’t lined up perfectly. Josh Micro magnetically attaches to the base and can be straightened at any point. Install the wall mount ring to the wall using the provided screws. Make sure the ring is snug, but no need to overtighten. If you misplace the screws, let us know and we can help you get replacements. In some cases you’ll want to get drywall anchors as well to help the screws hold. 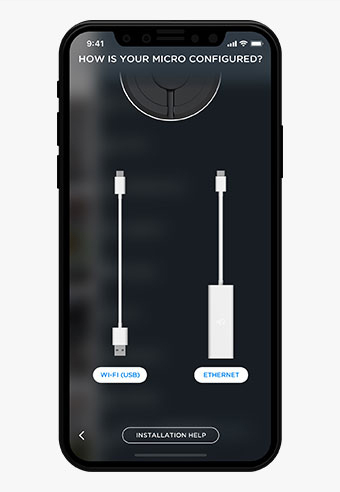 Connect the POE adapter (provided) to your POE cable, then plug the USB-C end of the adapter into the bottom of Josh Micro. When Micro is ready to set up you'll see the LEDs light up blue. If the unit doesn’t power on, make sure the POE cable is delivering both power as well as network connectivity. Bring the Micro to the wall mount ring while feeding the POE cable through the wall. It should should fit snug to the wall mount. Finally, rotate Josh Micro making sure the dog logo is properly oriented and level. 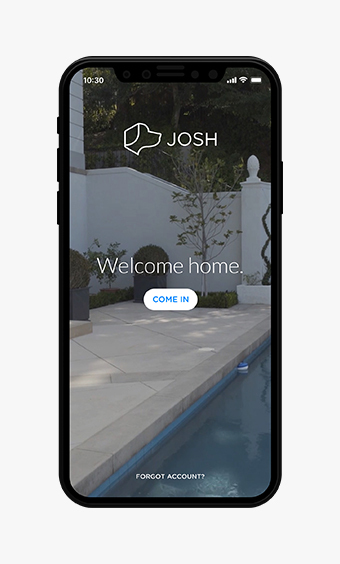 Configuring a Micro is done on the Josh iOS app using your Josh.ai credentials. If you don't know your login, or if you have a login but haven't bought a license yet, reach out to hello@josh.ai for help. Log in to the app, navigate to the device list (swipe to the left from the dashboard) and tap "+ ADD MICRO" at the bottom. Follow the steps outlined in the app to connect Micro to your home. If you run into any problems, don’t hesitate to contact support@josh.ai. Josh Micro has a number of exciting voice and touch capabilities. Visit the Using Your Micro page to learn more!